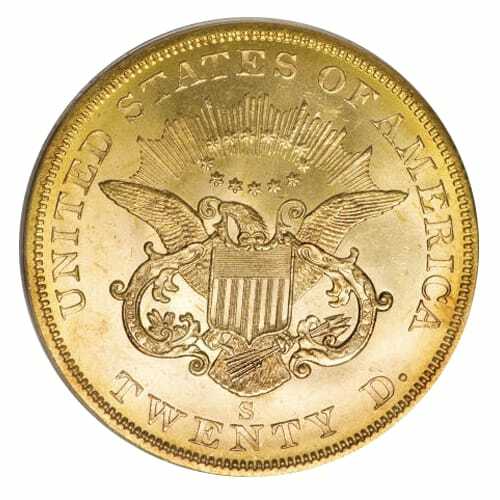 The twenty dollar Liberty Head, also known as a “double eagle,” was the first gold coin struck by the U.S. Mint. First authorized in early 1849, it was struck that year as a response to the sudden flow of gold, first in North Carolina in the 1830s and then compounded by the California Gold Rush in 1849. Prior to the Liberty Head, all U.S. coinage was made of silver, with the largest denomination being $10, or one eagle, hence the nickname, double eagle. The coin is evidence of the standardization, and capitalization, of the gold rush. The $20 Liberty Head coin was quite practical in its design. Its artwork is the same as that of the one dollar coin. Originally designed by James Longacre, the obverse shows a woman wearing a crown with “Liberty” inscribed on the side. She is encircled by 13 stars, one for each colony. On the reverse, with the help of his assistant Peter Filatreu Cross, the denomination of the coin and the date of its minting are wreathed from beneath. The words “United States of America” wrap around the design, closing the top. 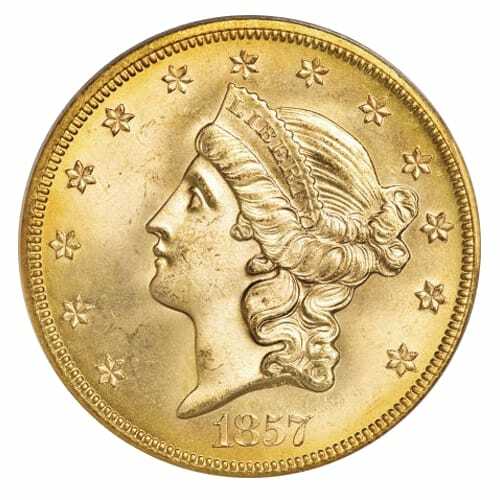 The coins were produced until 1907, when the heralded Saint-Gaudens double eagle came into production. To learn more about Liberty Head Double Eagle ($20) coins and to get current pricing, please call us at (800)355-2116.